Mince garlic. Roughly chop parsley. Bring a large saucepan of water to a boil; add cauliflower. Cover; cook for approx. 10 min. or until fork tender. Drain, reserving 1 cup cooking water. Place cauliflower in food processor or blender. Melt butter in frying pan over medium-low heat; add minced garlic and cook until fragrant. Remove from heat and add to food processor with cauliflower. Add reserved cooking water, milk, cheese, bouillon, and pepper to food processor; cover. Process until smooth. Add more cooking liquid or milk, if desired, to achieve desired consistency. 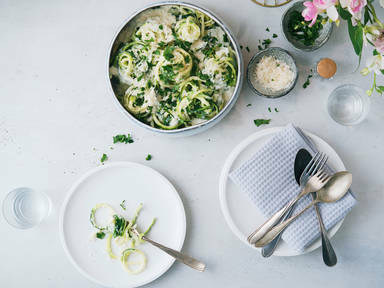 Using a vegetable spiralizer or peeler, cut whole zucchini into spaghetti-like noodles or ribbons. Heat oil in frying pan over medium-high heat; add zucchini and cook, stirring occasionally, for 2 – 3 min., or until softened. Add cauliflower Alfredo sauce and toss gently to coat. Season with salt and pepper if desired. Top with additional cheese and parsley for serving. Enjoy!